I live on the Gulf Coast, so fresh jumbo shrimp are not hard to find. Coming up with different ways to cook them on the Autoimmune Protocol can sometimes be the bigger challenge. I often see fried coconut shrimp on the menus at seafood restaurants, and it's always looked delicious. The Spicy Mango Dipping Sauce actually came first. I paired it with chicken tenders, and it was so good, I had to come up with another dippable! 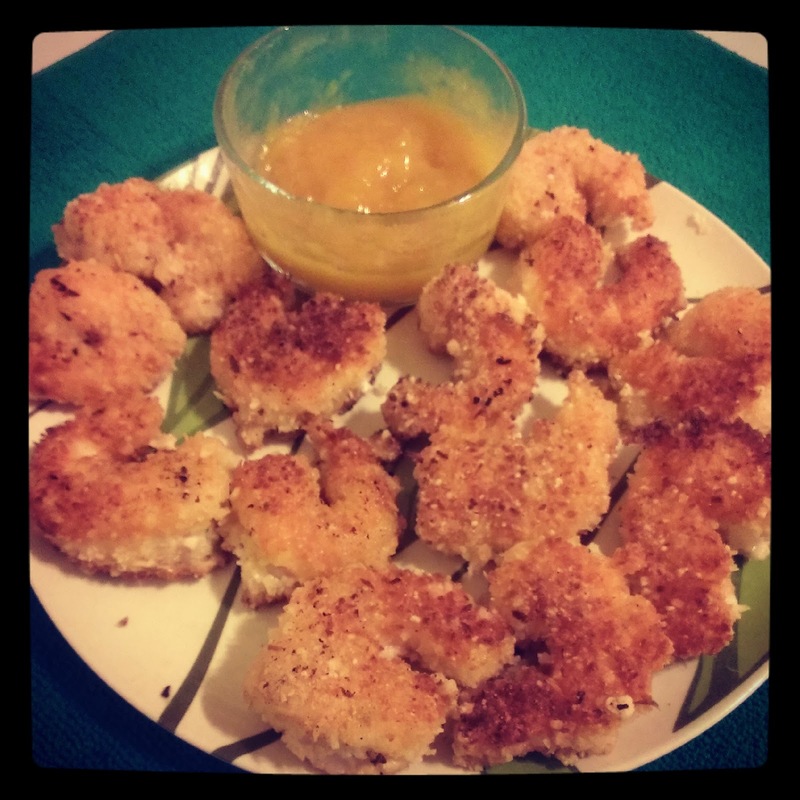 And jumbo shrimp breaded and fried in coconut was the perfect match. This dish also whips up pretty quick so it's great for a last minute dinner. An AIP-version of the 30 minute meal. Heat coconut oil over medium to medium high heat in a cast iron skillet (or other heavy skillet). Mix arrowroot, coconut flakes, ginger, sea salt, and black pepper together in a shallow dish. Dip the shrimp one at a time in coconut milk, then coat thoroughly in coconut flake mixture, and then carefully place in skillet. Cook until crispy and golden brown (about 2-3 minutes) and then flip. The shrimp should be cooked through already, but test one or two just to make sure. Serve with mango dipping sauce. Puree mango and lemon juice thoroughly. Pour into a small saucepan and warm over medium low heat. When warmed, add honey and combine thoroughly. Let simmer for about 5 minutes until it starts to thicken some. In a small container with a lid, combine gelatin and cold water and shake until no clumps remain. Add to mango mixture, and add in ACV and ground ginger. Start with one teaspoon and taste test. Continue to add ginger by the teaspoon until the spiciness is where you desire. Place in the fridge at least 15-20 minutes to thicken. (Makes about ½ cup).